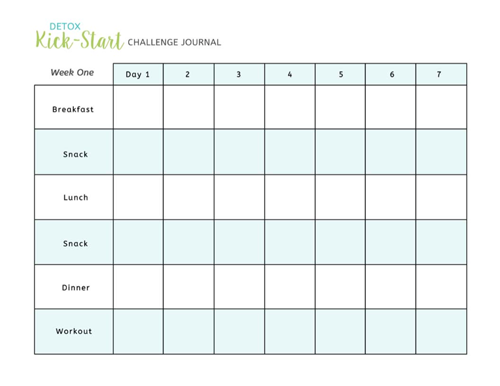 I like to practice what I preach, so when I released the 21-Day Kick Start Challenge this past weekend I decided to print-off the calendar and follow along. I won’t ask you guys to do anything I wouldn’t do myself! I even talked one of my friends into being my challenge partner. She and I started working out together this week, and I can’t even tell you how much easier it is to stick with it when you have someone laughing by your side. (We did the Ballet Beautiful “Swan Arms” yesterday, and it’s amazing how much your arms can burn without using weights! We felt like wimps.) My goal is to build muscle this summer, so I can keep up with my growing son– carrying around an extra 25 lbs. each day requires plenty of strength! Morning: Banana Nut Protein Shake (from my cookbook) with added chia seeds and collagen powder. I’m trying Vital Proteins pasture-raised collagen this week to see how it compares to to the brand I was using last month. I haven’t noticed a difference yet from using collagen, so I’m not sure I’ll continue with it, but I haven’t noticed anything negative, either. Regardless, this shake is very filling! Early Afternoon: I had leftovers from the previous night’s dinner. Creamy Caesar Salad (from the cookbook) and cold Cauliflower Fried Rice. My son shared bites of both dishes and LOVED them! I love that he’s starting to steal my food. Late Afternoon: After taking my son to his toddler gym, I was worn-out and starving, so I snacked on a few pieces of almond butter fudge from my freezer. It’s amazing how something so simple can taste so delicious! Dinner: When I’m experimenting with new recipes, I like to make something tried-and-true to go with it, so I know at least one part of our dinner will be good. Last night I made the Maple Mustard Glazed Salmon from the cookbook and served it with a side of experimental brussels sprouts– which also turned out pretty well. Dessert: I used the recipe for my cashew butter cookies, but made them with sunflower butter for a change. (And I left out the baking soda so they wouldn’t turn green.) My friends liked these better than the cashew version! We each had two for dessert. Overall, this day was probably a little too heavy on the sweets, but that’s what sometimes happens when I’m in a rush. I’m going to work on having more convenient vegetable snacks available for the rest of the week! It’s not too late to get your 21-Day Detox Kick Start Challenge. You’ll get it free in your inbox when you sign up for my weekly newsletter! Reader Feedback: What are YOU eating this week? Are you working on any challenges of your own this week? I’m wondering what your thoughts were on the vital proteins collagen vs Great Lakes? Any tips for using these and have you noticed a difference? Thanks so much! I didn’t really notice a difference between the two, but I also didn’t feel any better or worse using collagen after several months, so I’ve stopped using it for the time being. Just bought your book and am loving it! I’ve been a follower (on and off) of Food Combining for about 10 years. I’m currently trying to get back on track and am finding your book very helpful. In reading this post I see that you put collagen in your smoothie. I know that collagen is supposed to be easily digestible but I’m assuming that it’s against Food Combining “rules”. I guess I’m wondering if it upsets your digestion? I just picked up and read your cookbook last night. Its great and I have recommended several people to pick up a copy! 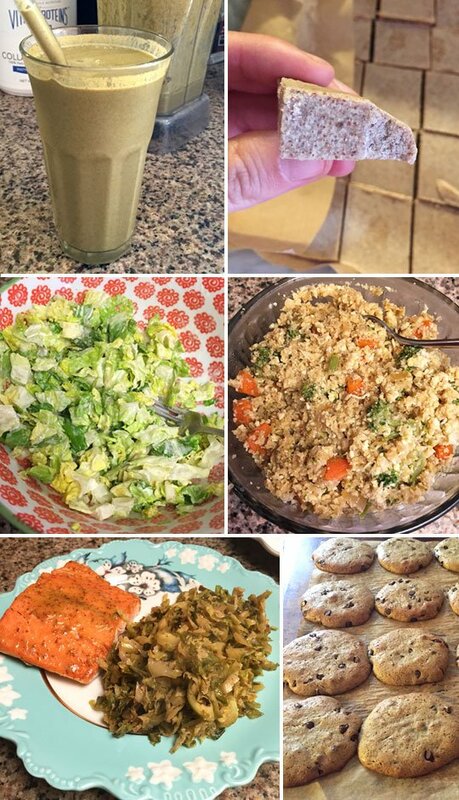 Easy to follow, simple recipes. Well written and easy to understand and navigate. I was going to do the 7 day jump start but the 21 day, I’m all in! Thank you Megan! After finishing up writing my Simple Green Smoothie eBook I am on a sugar detox this week after trailing and testing a whole host of smoothie, milkshakes, juices and more but its more just in response to my body saying ‘no more naturally sweet things’ for a few day so I just listen. So I have been eating lots of eggs, veggies , stir fry and salads – yum! I LOVE the recipe for almond freezer fudge. It was a lifesaver throughout grad school. Wow I don’t know what looks better, the salmon, almond butter freezer fudge or the cashew cookies. I could eat them all right now! My husband and I are both doing your 21 day detox cleanse! We just love having menu to follow with healthy meals and ideas what to eat. We loved the salmon and salt and vinegar Brussels sprouts from your cookbook! It was so easy to make and absolutely delicious. Thanks for all you do! Well, I’m built just like my dad and I’m so muscular! My body just wants to turn to muscle. I’ve always been so embarrassed by this (at the gym I was measured at under 12% body fat!) But….the good news is that I burn calories so fat and have a fast metabolism. And I need fuel and recipes just like you share, lots of healthy fuel to keep me going! My kids are 3 and 5 and weigh 33 and 35 pounds though and they want me to carry them at the same time! Yikes. Needy! Anyhow, I’m eating lots of healthy veggies this week. Fresh from the Farmer’s Market =) Have a great week!! Have fun exercising with your friend, totally agree, buddy workouts are the best! !